When you buy a home one of the things you’ll want to have done is a proper home inspection. 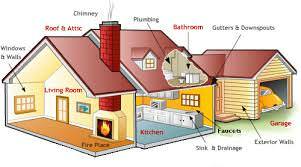 Home inspectors will inspect many items in the home and give you a report so you know what condition the home is in. Some buyers opt not to have a home inspection done and it is optional but its something that all Realtors should recommend. There are many home inspectors available both licensed and unlicensed. Licensed home inspectors have undergone more training and are held to a higher standard than their counter parts. Usually when a home inspector is hired they will plan for about 4 hours to inspect the property. Costs vary for home inspections depending on the size of the home but average about $400. Their process to inspect is potentially delayed with people asking questions as they inspect so give them the time they need to do a proper home inspection on their own. During that 4 hour inspection period they’ll invite you back in the last 30 minutes so they can go over the results of the inspection. This will be the time to ask questions and put a game plan together with your Realtor on what items you many want to ask for in repairs. For more information on hiring home inspectors and having a proper home inspection done, please contact us or leave a message below. We’d appreciate the opportunity to assist you.